New version (1.6.0a) of Disk Editor for Windows is available for download. Changes? Disk Editor for Windows is a handy utility for displaying and editing raw data on hard discs and other drives including removable drives and floppy disc drives. First version of DE was developed in assembly language in 1993. File data, physical disc data and logical drive data is displayed in text only, and text-numeric in 16/32 columns. The numeric data can be either in decimal or hexadecimal. By default, data is displayed in "read only" mode. The background color changes when the "edit" mode is selected. The color also changes to red whenever data is edited. 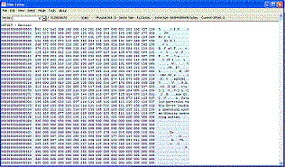 The use of this software require certain knowledge and experience on computer hardware and software since the Software provide tools to modify, change or overwrite the raw data on the disk and drives that may cause corruption or destroy the important data stored. The application requires Microsoft Windows XP SP2 or later operating systems running on systems with x86 CPUs and at least 128MB RAM. Some functions may not work under Microsoft Windows 8 & 10. DE_W32.exe is a portable application and can run anywhere. NoticeLicense.txt and HelpShortInfo.bin must be located in the same directory with the executable file. Help file; HelpShortInfo.chm should be in the same directory with the executable file.